This hooded jacket is the ideal project for someone with basic crochet skills. Since it utilizes only single and double crochet stitches (American terminology) and requires no construction sewing, it is as “easy” as it is attractive. (The option to include pockets increases the challenge a bit.) Sleeves are worked from the shoulder down, in rounds, so arm length can be customized. The jacket’s hood means there’s no need to tote along a hat, and provides a flattering “collar” when not in use. A two way zipper makes it a good choice for all types of activity. Consider using your favorite color sock weight or self patterning yarn to create a wardrobe basic that you will not see coming and going! 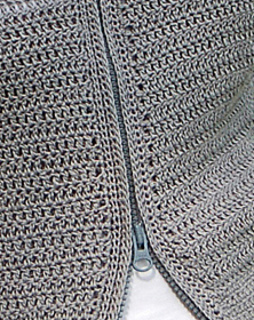 Pockets are optional - pattern rated easy without pockets, intermediate with pockets. Visit my Patternfish and Craftsy stores to see more patterns.